1 Eggplant Asian if available. 2 Tbs of peanut oil. 2 Scallions sliced on the diagonal. 1″ piece of peeled & minced ginger. 1/3 cup of canned chicken broth. 2 Tbs of soy sauce. 1 Tbs of rice vinegar. 1 Tbs of light brown sugar. 1. Cut the eggplant into manageable wedges each about 1 1/2 ” wide. 2 Heat a large wok & add the 2 oils. When the wok is at the smoking stage, add the eggplant in batches if necessary, add S&P & stir fry until seared & browned. 3. Remove to a bowl & cook the remaining eggplant in the same manner. 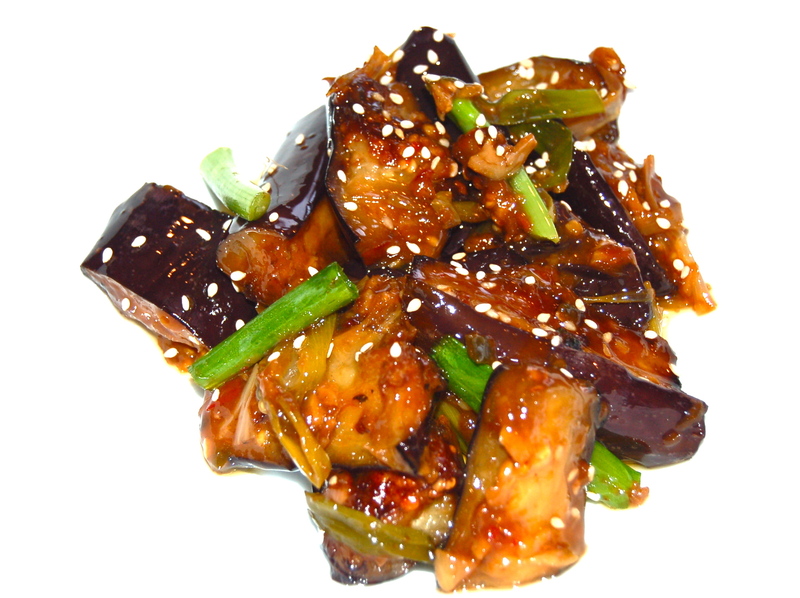 When all the eggplant has been cooked, add the scallions, ginger,garlic and red pepper flakes & stir fry until fragrant. 4. Add the broth,in a small bowl mix the soy sauce, vinegar, sugar & cornstarch. Pour the mixture into the wok & cook for 1 minute or until has thickened. 5. Return eggplant to the wok toss until the sauce is absorbed. Garnish with sesame seeds & scallions.